Aluminum Truck Dockboards(Welded aluminum Crubs 6000lbs) Engineered and built to maximize safety while handling heavy forklifts and loads. Locking legs prevent movement during loading and unloading operations. 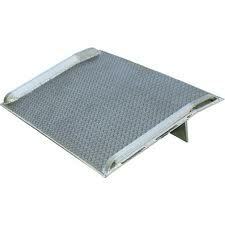 Welded aluminum safety curbs prevent accidental runoffs and provide visible driving lane. Locking legs are uneven to allow the dockboard to sit canted, while not in use, for easier pickup by forklifts. Bend is 11° and 9" from the edge and the legs are 12" from the edge. Manufactured in compliance with OSHA. Specs: Uniform Capacity 6000.